One of only four rooms with a four-poster bed, a luxurious king, nestled below vaulted ceilings, the Viognier room epitomizes class. 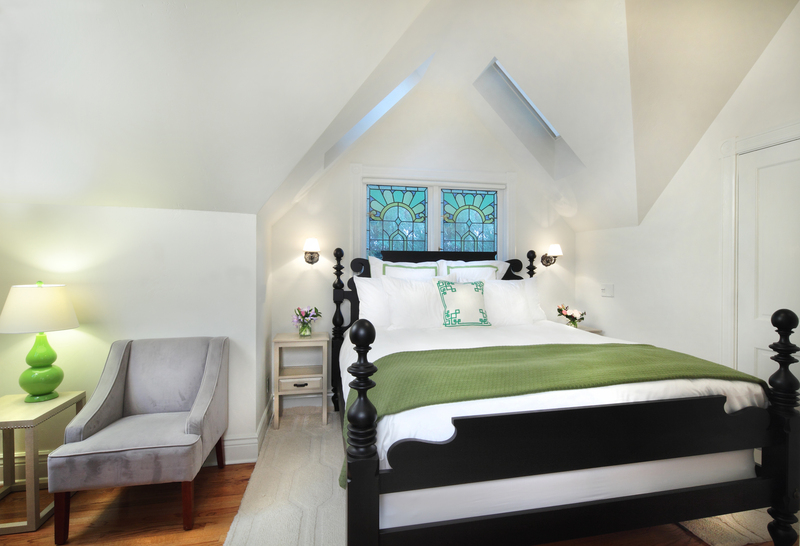 The natural skylights pair perfectly with the stunning stained glass and help illuminate the space with a variety of colors. Perched in the corner, a small table and plush chairs provide the ideal setting for tasting one of the Wilson Family’s award-winning wines, while the neighboring fireplace only helps ratchet up the atmosphere. 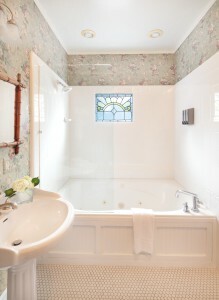 A step inside the gorgeous bathroom finds you face to face with another of the stained glass windows, with pedestal sink and a large shower and tub in the foreground.